If you are wondering about the best way to bring style and class to the fireplace in your home then here are some ideas for making it really stand out and become the focal point of your room. 1) Flowers - use a large vase to have a big flower display on the top of your fireplace. The eye will automatically be drawn towards it, particularly if you use large blooms in bright colours. If you want a more suble approach choose colours that match your room to make them blend in more but still have an impact. If you don't want to buy fresh flowers every week then you can use dried or silk, but make sure you keep them looking clean and be aware that they won't be so eye catching as the real thing. 2) Photographs - if you put family photographs on your fireplace it draws attention to the relationships in your house. The fireplace is usually the focal point of the room, so by putting framed photographs on top of it, it will really help you realise who is important to you in your life. 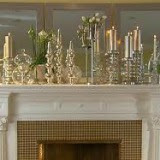 3) Candles - these are great for bringing out the romance in anyone. If you use subtle lighting elsewhere in the room and light candles on the fireplace it makes for a lovely cosy atmosphere and adds romance to every situation. 4) Ornaments - if you use items that you have picked up at special times in your life, like when you have been travelling or presents for special anniversaries, then looking at your fireplace will always bring you happy memories from the important times you have had. 5) Items made by your children- children often make little pots, candle holders or ornaments out of clay when they are at school. These are a great way to decorate your fireplace, as they are a great talking point when guests visit and show your children that you really value them by displaying their work. 6) Use seasonal decorations - in the autumn you can have a display of pine cones and fruits, the winter you can use holly and ivy, or spray leaves white to look like snow, the spring you can put spring bulbs in pots and have a display of mini daffodils or crocuses, and the summer could allow you to have a beach scene with shells and wooden logs or simply beautiful flowers or roses. 7) A moneybox - this isn't necessarily a pretty item, but it is a great place to put all those odd coins you find when you are cleaning your house. You can save up and give the money to your favourite charity, and they will benefit when you may not have given them anything otherwise. 8) A picture or mirror - a lot of people would hang these above the fireplace, but they can be just as effective propped up on the mantle piece above the fire. Depending on the piece of art or mirror that you choose, you can change the whole atmosphere of the room. A mirror can make the room look bigger, but equally can make it feel cramped if it is reflecting a lot of heavy furniture or clutter. A picture can make the room feel brighter or darker depending on its subject so choose carefully so you produce the kind of mood you want for your room. May I also suggest a beautiful new fireplace mantel ?